Unknown. May block postsynaptic dopamine receptors in brain and depress areas involved in wakefulness and emesis. Also possesses anticholinergic, antihistaminic, and adrenergic-blocking properties. Adults: Hospitalized patients-Initially, 25 mg I.M; if necessary, give an additional 25 to 50 mg in 1 hour. Increase dosage gradually, as needed, for several days (up to 400 mg q 4 to 6 hours in exceptionally severe cases) until symptoms are controlled; then give 500 mg P.O. daily. In less acutely disturbed patients, 25 mg P.O. t.i.d., increased gradually until effective dosage is reached (usually 400 mg P.O. daily). Acutely disturbed outpatients-Initially, 10 mg P.O. three or four times daily or 25 mg P.O. two or three times daily. In more severe cases, 25 mg P.O. t.i.d. ; after 1 or 2 days, increase daily dosage by 20 to 50 mg at semiweekly intervals until effective dosage is reached. Adults: 25 to 50 mg P.O. three to four times daily. If symptoms continue for 2 to 3 days, give 25 to 50 mg I.M. ; if symptoms still persist, give 25 to 50 mg by slow I.V. infusion with patient positioned flat in bed. Adults: 25 to 50 mg P.O. three to four times daily. Drug is usually discontinued after several weeks, but some patients require maintenance doses. Or 25 mg I.M. t.i.d. until patient can tolerate oral doses. Adults: 25 to 50 mg P.O. three to four times daily (given with barbiturates, as prescribed). 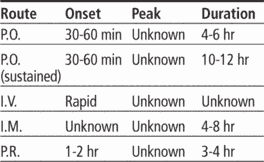 Total dosage and frequency determined by patient response. ➣ Know that I.V. infusion is recommended only for severe hiccups. • When giving by I.V. infusion for intractable hiccups, dilute in 500 to 1,000 ml of normal saline solution and infuse slowly. • For direct I.V. injection, dilute to 1 mg/ml using normal saline solution. Administer at a rate of at least 1 mg/minute for adults or 2 mg/minute for children. • When giving I.M., use Z-track injection method to minimize tissue irritation. • Know that in preoperative use, drug increases risk of neuromuscular excitation and hypotension when followed by barbiturate anesthestics. • Monitor blood pressure closely during I.V. infusion. ☞ Stay alert for signs and symptoms of neuroleptic malignant syndrome (hyperpyrexia, muscle rigidity, altered mental status, irregular pulse or blood pressure, tachycardia, diaphoresis, and arrhythmias). Stop drug immediately if these occur. • Assess for extrapyramidal symptoms. • Tell patient to take capsules or tablets with a full glass of water, with or without food. • Instruct patient not to crush sustained-release capsules. • Tell patient to mix oral concentrate in juice, soda, applesauce, or pudding.